Endless gravel roads and footpaths offer unfettered access to the rugged surrounding peaks, and the indigenous forest. Tierkop return: 1.5-2 hours. Full route: one day. Expect lots of mud: the rainy season in George lasts for most of the year, because of its close proximity to the coast. It’s generally warm and pleasant in the summer; but in winter, temperatures are cold and it snows – especially higher up, close to George or Cradock Peaks. George has long been considered the poor, brush-cut cousin of funky towns like Wilderness and Knysna. But a recent boom in eco-tourism has changed this; thanks to the forestry industry, the inland city is thriving. 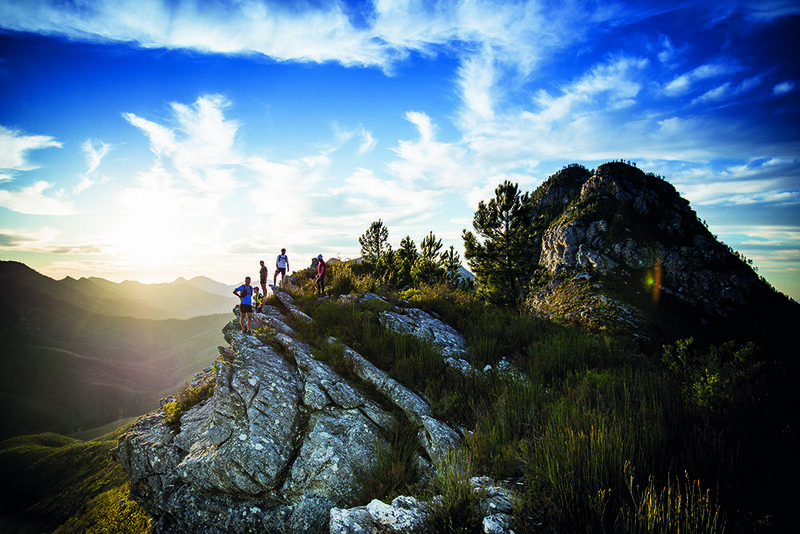 Endless gravel roads and footpaths – many of them linked to the legendary Outeniqua Hiking Trail system – now offer unfettered access to the rugged surrounding peaks, and to the indigenous forest that blankets the foothills. You can add to this a number of Blue Flag beaches literally just down the road, including the world-renowned surf break at Vic Bay. There are also dozens of fresh-water lakes, rivers and canyons. The climb up to and beyond Tierkop Hut is infamous. Local runner Jacques Mouton led us onto the singletrack beyond the hut, which ascends towards the base of Craddock Peak. 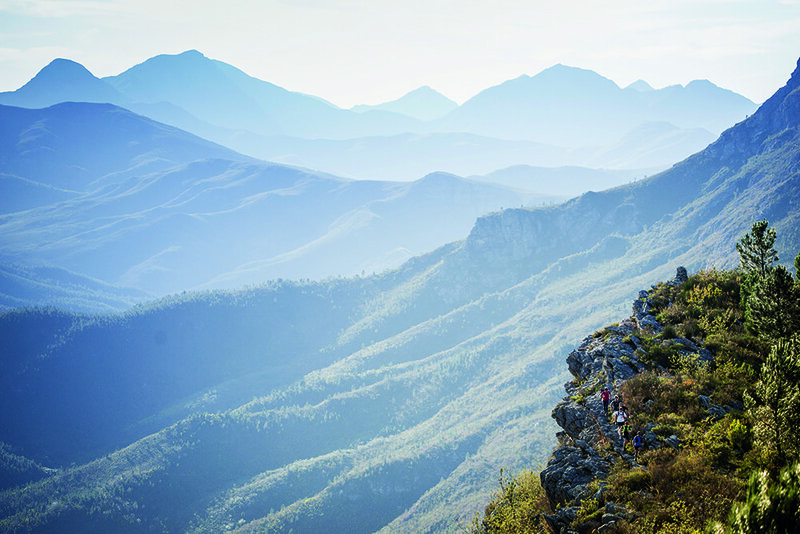 The Tierkop Trail is traditionally a pan-handle run, accessed from either NMU’s Saasveld Campus or the Garden Route Dam trailhead. Follow the Hillbillies MTB Club signage through lower forests and plantations, towards the hut. Continue along the footpath to the right of the hut in an easterly direction, until you reach a trail that leads clockwise around Tierkop, and then links back to the road you took on the way up. From Saasveld, this makes for a 15km round trip. There’s also a one-way run, all the way to Herold Wines on the other side of the mountain, and a circular route that traverses the entire range. Once at the hut, follow the singletrack in a westerly direction – aim for the high peaks. At 16km, there’s a fork in the trail, which follows after the main trail forks at approximately 9km. Once you’re on the other side of the mountain, the vegetation changes to a mixture of dense riverine woodland, and there are fields of fynbos all the way down to Herold Wines (a further 5km). Should you choose to keep left, the route contours along the mountain, all the way to Montagu Pass, where you can connect to Cradock Pass, and back over the mountain to Witfontein Forest Station. It’s not recommended you tackle this monster ±30km run alone. RELATED: 10 ‘Do-Before-You-Die’ Trail Runs! Fly to George airport, or drive east from Cape Town on the N2 (approx 4.5 hours). For more information, visit georgetrails.org.za. 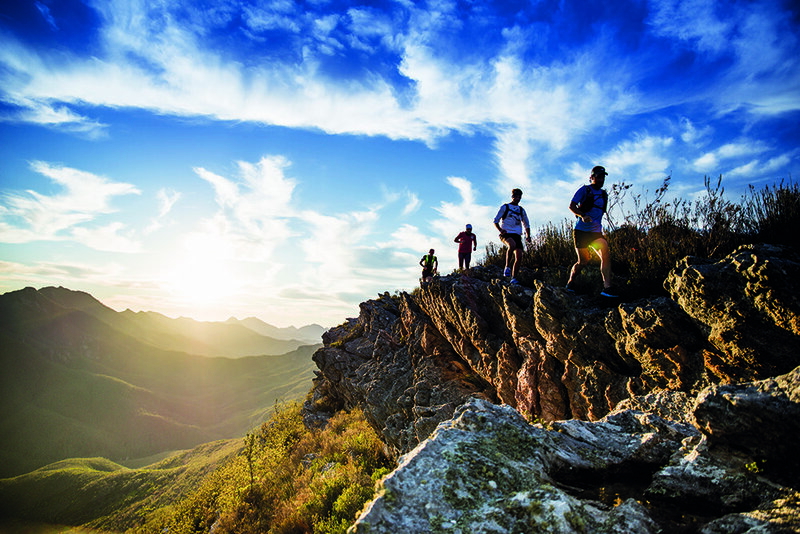 The George Trail Festival covers much of the route and takes place in December (ecobound.co.za). 5 Reasons to Run the Marakele Marathon!